Today: a “warm-up” for a proper cool-down this week! Clouds form when air rises, cools and water vapour condenses into water droplets (clouds are tiny water droplets and/or ice crystals, not cotton wool!). 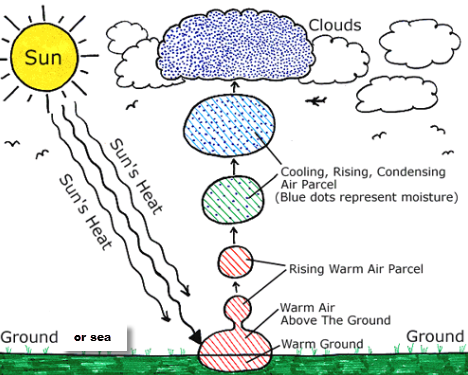 The main driver of rising air is the heating of an airmass by a relatively warm surface. The North Sea is still quite “warm” at a balmy 7°C (note the nearby higher surface temperature in Margate 4.5°C) and this was sufficient to warm the chilly Arctic airmass travelling across it. 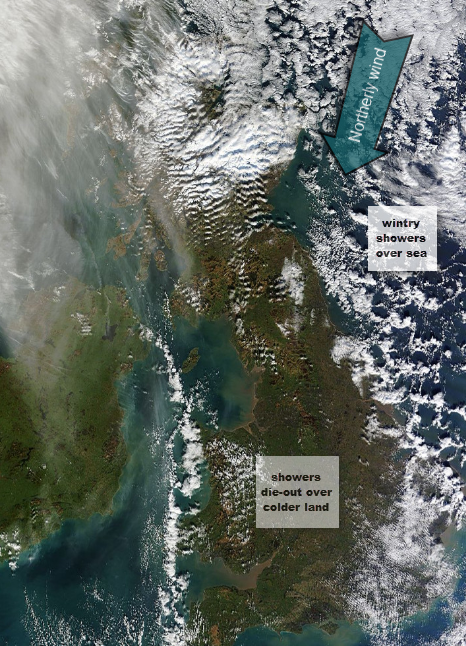 This warming caused convective uplift of warm bubbles of air (thermals) which formed shower clouds over the North Sea. Think of the bubbles formed when a cold pan of soup is heated on the stove: they rise up, just like thermals rising through the atmosphere. Rising thermals initiated over the North Sea produced the shower clouds visible on the video marching across the East coast. The showers died-out inland because the land in January is colder than the sea (note the lower surface temp in Reigate 2.5°C) so warming is reduced and thermals are much less frequent. Fluffy clouds may form but do not rise to any great height: these are called “fair weather cumulus”. Showers and clouds tend to fade away in the evening because thermal activity is reduced. (n.b: April showers occur for similar reasons: the stronger Spring sunshine warms the ground quickly and sets off rising thermals through airmasses which are still cool from the winter. We must wait a few more months for the sun to get powerful enough for showers of this nature to kick-off inland: something to look forward to!) Temperature changes with height are called lapse rates. Lapse rates control cloud formation and precipitation. Try this site for more info. The Arctic air mass will be replaced by warmer, wetter westerly winds tomorrow. But don’t despair, if you enjoyed the fluffy cumulus clouds and outstanding visibility today then you will be happy to learn there is more to come this week! Models agree that another long cold snap is due to return, initiated by an Arctic airmass on Wednesday. This cold snap could last into mid-February with the possibility of an especially cold dip in temperatures next weekend.